Unique VBA Project access technology - file modification is not required. All into one file source code export. 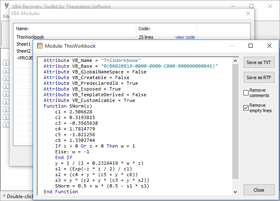 VBA Source Code Preview:You can use our tool to quickly review VBA code in popular files (like AutoCAD, CorelDRAW, MS Excel, MS PowerPoint, etc.) in order to effectively filter files with potentially harmful code. It reveals hidden modules, helps in basic deobfuscation, previews code with syntax highlighting allowing you to have early warnings on suspicious files. We believe that it is important to check VBA source code before opening any file in VBA-enabled application. 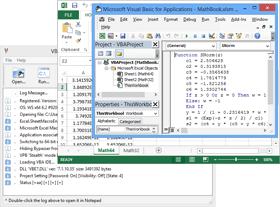 VBA Projects in VBA IDE (Integrated Development Environment):There are number of reasons for VBA IDE to block access to VBA Project or source code: project can be locked with or without a password, code is locked in files shared for multi-user access, project settings can be misconfigured or corrupted, etc.VBA Recovery Toolkit changes project settings back to default in VBA IDE internal records without modifying a bit in your file. This way we can re-enable access to source code and project settings regardless of file format or the program used to open it. The method is applicable to any VBA Project in any VBA-featured document: MS Office 97 - 2019 [Access, Excel, PowerPoint, Word, etc. ], Visio, FrontPage, AutoCAD (*.dvb), Corel WordPerfect, CorelDRAW and Photo-PAINT (*.gms), SolidWorks (*.swp), etc...You can also check VBA Recovery Toolkit Modes of Operation. 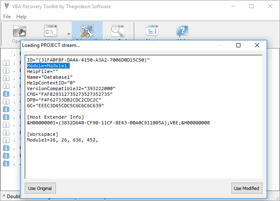 "Advanced mode" for on the fly PROJECT stream editing:"Advanced mode" is a new feature of VBA Recovery Toolkit created to give developers direct access to VBA Project settings. 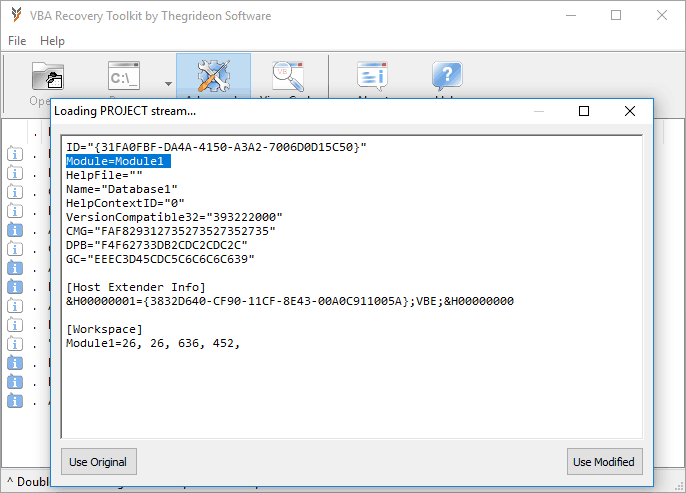 It was originally designed for our research into VBA Projects internals.VBA Recovery Toolkit intercepts VBA IDE access to VBA PROJECT streams and allows you to change it any way you want. For example, hidden module can be created by removing module reference (e.g. "Module=Module1") or hidden module restored by putting missing reference back (list of modules is available in VBA Recovery Toolkit Source Code Viewer).VBA Recovery Toolkit works with VBA IDE directly thus file formats are not important. 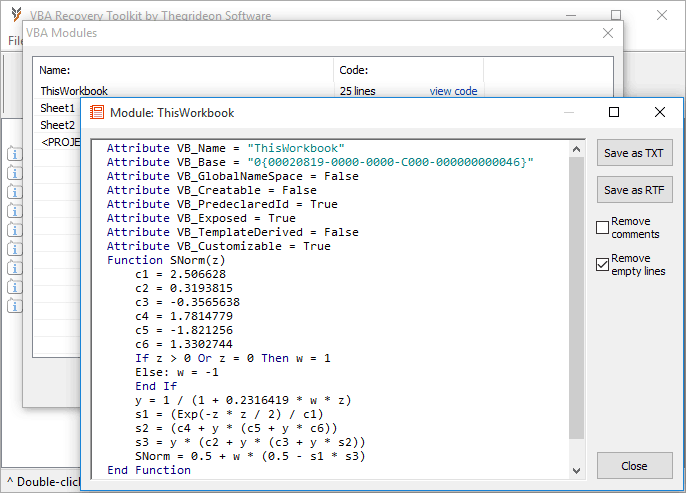 "Advanced mode" can be activated for all VBA Recovery Toolkit Modes of Operation. To summarize, whatever the case is, you can access your VBA Project, view source code, fix or edit project settings and save the file or just check your code and leave it untouched. Note: The only special case is compiled MS Access database files (.mde and .accde) - these databases are saved with precompiled VBA code only, without source code at all, so the locked state can be fixed, but you will see the list of compiled modules and some small pieces of code left only or VBA IDE will report error "40230". You may try Access Forensics for MS Access format verification as well as code preview. Code Viewer shows first 15 lines of source code. You can reset VBA Projects locked with the passwords "trial" or "TRIAL" only. 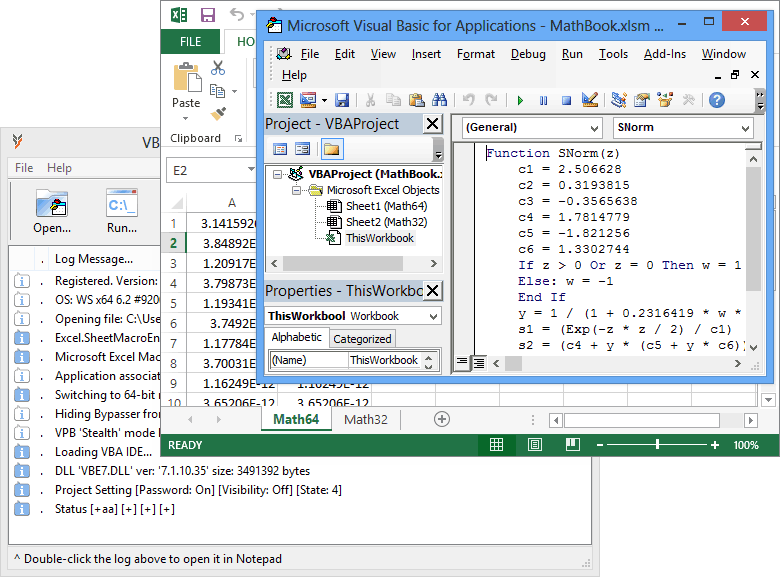 Create test VBA Project, protect it with the password "trial" and use trial version to open it.